A single unspayed cat could give rise to 420,000 descendents in just seven years. This has been the cornerstone statement in the explanation for why millions of dogs and cats are euthanized every year. However, a study conducted by veterinarian Christine Wolford found that the number is actually less than 200. Winograd, a former shelter director and founder of the No Kill Advocacy Center, believes that the study exposes the most fundamental lie perpetuated by shelters. Healthy, adoptable dogs and cats are killed under the guise of pet overpopulation when the reality, he says, is that current shelter directors are simply refusing to embrace proven methods for reducing the death rate. 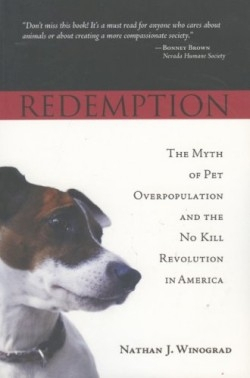 Redemption is both a history of the humane movement in the United States and an aggressive call for a No Kill nation. The first Society for the Prevention of Cruelty to Animals (SPCA) was created in New York City in 1866 by Henry Bergh. When the city offered Bergh funding to take over the operation of the city pound, he refused on the grounds that his group was founded to save animals’ lives, not to end them. Ironically, 100 years later the killing of dogs and cats in shelters had become the norm. Even People for the Ethical Treatment of Animals (PETA), a group that fought to end animal abuse and killing in research labs, on farms, and in the wild, endorsed killing dogs and cats in shelters. In contrast, the San Francisco SPCA and the Tompkins County SPCA implemented off-site adoption events, low-cost and free spay and neuter clinics, foster care networks, and other programs that dramatically reduced their death rates. Tompkins County has become a true No Kill community, saving every healthy or treatable animal that enters its shelter system. For Winograd, this is a story of “heroes and villains, betrayal and redemption.” Clearly, he feels that nearly every shelter in the nation, as well as national groups like the American Society for the Prevention of Cruelty to Animals and the Humane Society of the United States, are the villains. He rarely praises efforts to move in the right direction without then criticizing them for not going far enough. He gives the impression that shelter workers are lazy, sloppy, and “gleefully” advocating killing the majority of animals that enter their facility. Winograd’s book is well-researched and offers a comprehensive explanation of how to implement No Kill, but while his message will be well received by members of the No Kill movement, his adversarial tone may turn away possible converts. With the average urban shelter routinely killing eighty percent of cats and more than half of dogs, one hopes that Winograd’s tone does not overshadow his message.